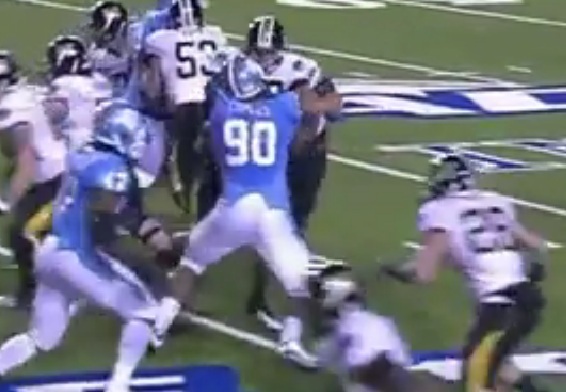 Is UNC defensive end Quinton Coples the next Jason Pierre-Paul? Jene Bramel says the potential is there but like everything earned in life, he has to put in the work to hone his gifts. Photo by Jene Bramel. Editor’s Note: Dr. Jene Bramel is a staff writer at Footballguys.com where he is among the best in the fantasy football business analyzing individual defensive players and player injuries. His top-notch work includes the columns “Reading the Defense,” “Second Opinion,” and his popular segments on The Audible podcasts. Jene would never tell you these things himself, but since I get to play editor he just has to deal with the fact that he’s getting the praise he deserves. Whenever I get the chance I beg him (and on occasion, “throw” a basketball game or two), to contribute here at the RSP blog. Follow Jene on Twitter @JeneBramel. UNC’s Quinton Coples has the frame and body type that makes scouts drool and defensive line coaches want to stand on a table. That’s not hard to do when a defensive end from an ACC school has the height (6’6″), weight (281 pounds), hands (10-plus inches), arm length (33-plus inches), and wingspan (in excess of 80 inches) that makes him a top-10 prospect in most drafts. Although his frame and athleticism are NFL-ready, Coples has flaws in his technique that may keep him from reaching his vast potential during his rookie year. Coples isn’t alone in this regard. The great majority of promising all-around defensive end prospects take at least a season to refine their technique and become strong enough to hold their own against the caliber of offensive tackles they’ll face for 60-70 snaps each Sunday. 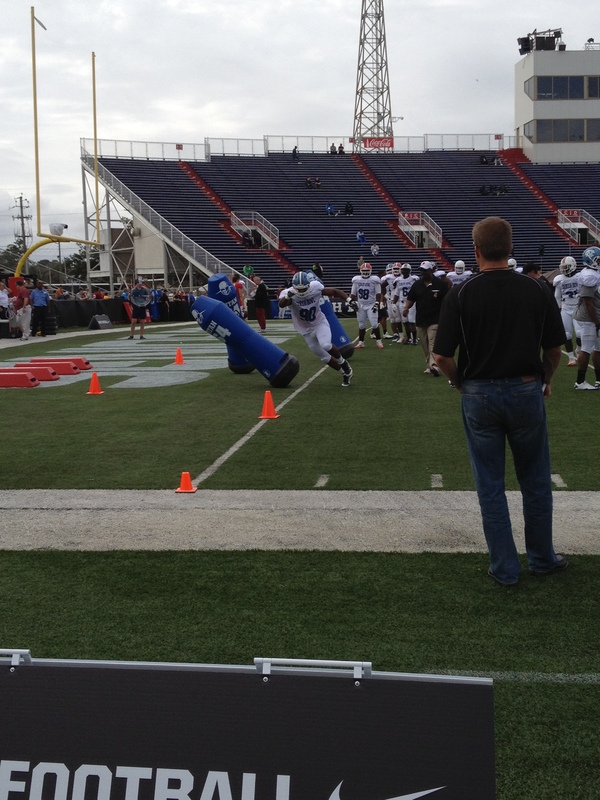 Coples was dominant during Senior Bowl practices, regularly overpowering whichever offensive tackle was across from him. 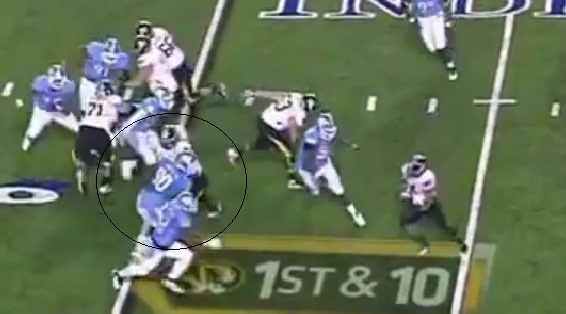 But there were also many instances in Mobile when Coples played too high and with a questionable pad level. For the most part, he got away with it during those practices because many of the players he faced are likely to become average NFL starters at best. Should Coples be drafted by Jacksonville or Miami in the top 10 and face quality NFL offensive tackles in Houston, Tennessee, and New England twice a year, his lapses in technique could limit his production. Length, hand size, a quick burst off the ball, and athleticism have rightfully earned Coples consideration early on the first day of the draft. But they won’t necessarily carry the day when a pro offensive linemen gets his hands on him. When that happens, pad level and hand placement will determine whether Coples can win the edge as a pass rusher or set the edge as a run defender. Though Coples has suggested that some of his drop in production this season was due to the team asking him to take snaps at defensive tackle, there are more than enough examples of questionable technique during his 2011 season to argue that he’ll need refinement and coaching to reach his potential. This analysis of Coples’ stance, get-off, and base should underscore what is involved with maintaining good pad level and maturing into a productive NFL edge defender. Playing with good pad level begins with the stance. Many defensive linemen with Coples’ length might have an issue getting low off the snap, but his athleticism allows him to coil into a good starting position with a strong base on the balls of his feet. Note the flat back with the heels up. This is a defender that should be ready to explode from his stance while remaining lower than his opponent. But we'll soon learn this was not the case. A defensive end facing an offensive lineman in a traditional run blocking stance will engage his opponent immediately. He is taught to strive to stay under the offensive lineman’s pads and shoot both hands out quickly, extend his arms and keep his hands inside the shoulders to win leverage both above and below the waist. As you can see in these next two images from an early snap against Clemson last October, Coples is capable of doing exactly that. Against LT Phillip Price, a player at least an inch shorter, Coples comes out of his stance well, establishes the lower pad level, and extends his arms to control the blocker. Coples good technique helps him set the edge and avoid letting Price turn him inside and closing the outside rush lane. 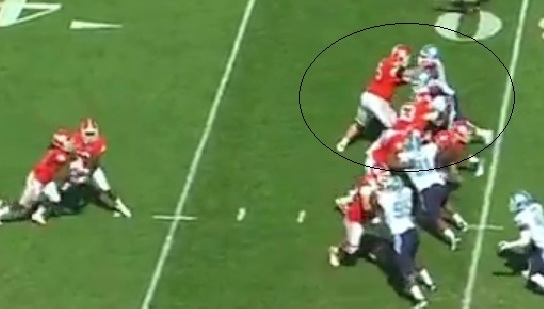 A few frames later Coples easily sheds Price once the ball carrier commits to the inside. 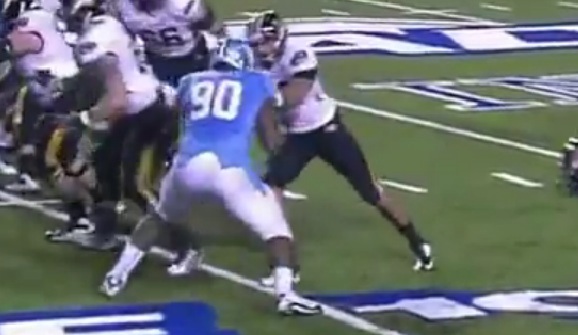 The UNC defensive end is now in position to make a play. Coples’ wide base and inside move give him the surface area and angle to make the play in this situation. However a defensive end facing a tackle sitting back in a pass blocking alignment may not engage his opponent for a couple of steps. When a defensive end comes out of his coil as he sets up his pass rush move in this case he’s at risk of losing the battle to establish good pad level. 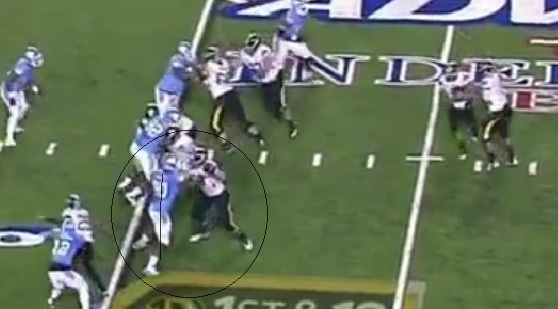 Coples struggles in this situation against Missouri in the Independence Bowl. 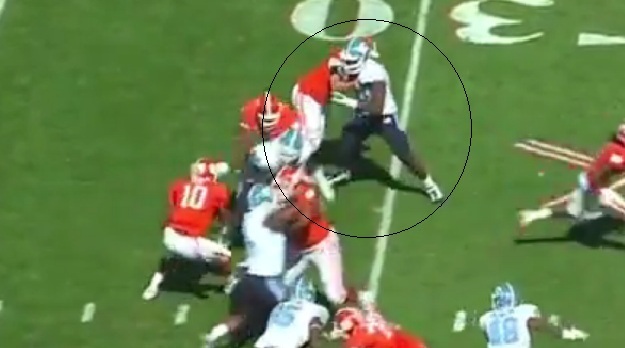 Despite his good initial stance from the first play analysis image above, Coples is nearly vertical by the time he takes two steps towards the offensive tackle. Coples' poor get-off where he takes a vertical approach from his stance results in a narrow base with his feet. He also exposes his chest to his opponent's hands. Although Coples is strong enough to extend his arms and get into a position to shed the lineman at this moment, he gives up any chance of anchoring his lower body and generating good pad level to prevent what happens next. Despite nearly three yards of penetration beyond the line of scrimmage, the tackle bends Coples backwards at the waist and pushes him back to the line of scrimmage before the defensive end’s advantage in base strength and hand strength kicks in and allows him to re-anchor. On this play, Coples is strong enough to quickly shed after stopping his negative momentum and with the help of his OLB, still make a stop. Against a better offensive tackle this quick and early loss of leverage will often lead to a big play for the offense – top-10 prospect or otherwise. Now compare that Independence Bowl sequence with this two-image series of a similar play in which Coples stays low in his approach and maintains his pad level until he engages the blocker. On this play, Coples faces a tight end coming down the formation to block him. 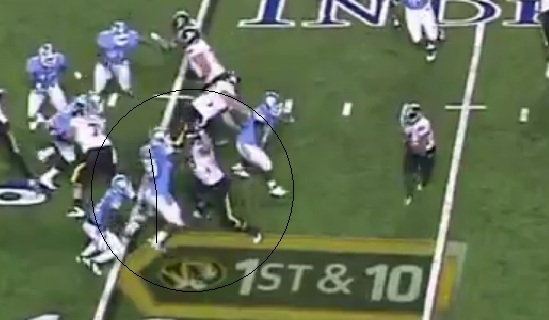 Note Coples' base, good hand position inside his opponent's pads and the relative height of the DE's shoulders pads versus those of the Missouri blocker. Unlike the previous series where Coples had to work very hard to overcome his lapse in technique, this play highlights how dominant Coples can be when his technique is right. Still well under his opponent’s pads, Coples actually lifts the blocker onto the toes of one foot, turns the opponent inside, and sheds the block behind the line of scrimmage. That’s the tease with Coples. You can see flashes of physical and technical dominance on film, but there are many instances when he seems to rely on his athleticism rather than technique. With professional offenses running out of spread sets more often, he’s going to see lots of instances where he’ll have to maintain good posture and leverage off the ball until he’s engaged. While he flashed dominant pass rushing skills in the pit during Senior Bowl practices, it will be critical for Coples to maintain that pad level to achieve success as a rusher in the NFL. The swim move he prizes will have little chance if he stands up and invites an NFL offensive lineman into his chest. Proper pad level will also help him achieve a better lean and angle to flatten his edge rush move. When he gets too tall off the ball, he winds up too far up field. Good coaching, a strong work ethic, and film study will all help Coples reach his potential. Coples says that he feels Jason Pierre-Paul is the NFL defensive end his game resembles most. I like Coples’ potential and agree with those that believe he’s easily worthy of a top ten draft selection. It may take time for Coples to overcome some of these bad habits and establish himself as a dominating presence. Pierre-Paul didn’t break out until his sophomore season. Don’t be surprised if it takes Coples a year of seasoning to do the same. For more analysis like this at every offensive skill position, purchase the Rookie Scouting Portfolio available here on April 1, 2012. I’m very much enjoying the Jene’s articles. I thank the Gridiron Gods for guys like you, Matt & Jene, who know what they heck they’re talking about and can articulate it for digestion by an enthusiastic layman like myself. It is so helpful and appreciated to see the technique issues translated in ways I can understand and then apply to my own sophomoric study. Much appreciated, as always. We appreciate you reading, Ryan. We’re all learning. We just happen to document our learning process.